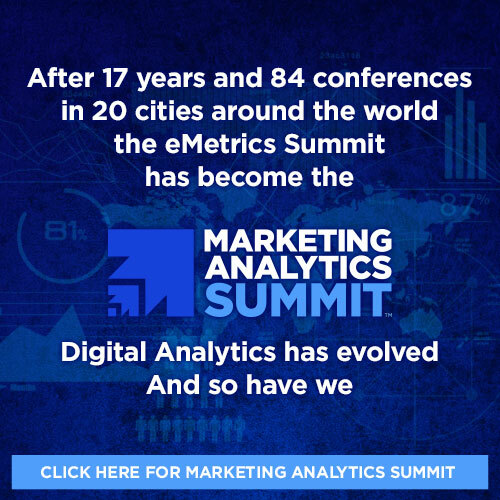 Though this was my first eMetrics Summit, it will definitely not be my last! All analysts, regardless of skill level and experience, can benefit from the relevant information presented from speakers, presentations, and networking activities! The Scene: Me, back from eMetrics. The Location: Office of the Executive VP. The Topic: I casually drop by, to discuss my interest in links. Me: …if we can get links from sites like that…. Exec VP: [doesn’t understand, but pretty much glad to see anyone this excited about something] Me: …that’s why links are so important. Exec VP: [eyes go to 5% glazed over] Me: …so that’s why I’m so interested in 301 redirects. Exec VP: [eyes go to 10% glazed over] Me: ….it’s a pretty obscure topic. Exec VP: [eyes now 15% glazed over] Me: …[thinking fast] …but anyway, I’ll shield you from all that. What’s important is that you give me education and resources, I’ll give you business. Exec VP: [eyes clear, smiles, expression says, “This guy gets it.”] Me: …[turn to leave] Exec VP: Great to have you back! So thanks Jim. : ) This really happened. Jeremy Cooker, Consultant, New Orleans Tourism Marketing Corp.
Well, it’s over and I am tired. It was a great event. My head is still spinning.